· LANDING ON BOTH FEET – MAXIMAL SPRINT TO SQUARE NO. .3. · MAXIMAL SPRINT TO THE 40 CM HIGH HURDLE – RUNNING AND JUMPING OVER THE HURDLE – LANDING (right side oriented, according to the chart) AND ABRUPT BRAKING, IN SMALL STEPS (max. 2-3 steps) – FAST BACKWARDS RUNNING (3-4 steps) – STOP – SHORT DIAGONAL SPURT TO THE LEFT – RUNNING AND JUMPING OVER THE HURDLE – BRAKING – BACKWARDS RUNNING – STOP – SPURT – RUNNING AND JUMPING OVER THE HURDLE. Everything must be carried out at top speed/velocity reaction. Jumping over the hurdles, going backwards, spurts etc. must be only carried out in running posture, without using jumps forwards, backwards or sideways from both feet. · Timing can be done electronically or manually, in seconds or hundredths of second (e.g. 19’’54/100). Before presenting the procedure there is one thing that everybody must be aware of: K’TEST TOTAL is a succession of 30’’ effort-blocks. Each effort-block consists of an effort element of variable intensity followed by a resting period that rounds up the 30’’ time given for the whole block. 1. – The track will be carried out according to the previously presented procedure within approx. 20’’ and will be followed by an approx. 10’’ resting time (during which Coach 1 is recording and writing down the player’s performance, e.g. 17’’63/100). The next player will start the track, and implicitly the test, immediately after the times obtained by the previous player are noted down, that is within a period of 10’’. He will perform everything according to the description below. The following players that are to be tested will do the same. 2. – A 30’’ resting period follows, during which the player goes to Point 1 on the start line to get ready for the 20-metre sprint. 3. – The warning commands regarding the time left from the 30’’ time, as well as the preparatory commands (such as 1 – ‘get ready’, 2 – ‘attention‘ / ‘get set’) and the signal for starting sprinting (the 20-metre and 50-metre sprints) are given by COACH 2 (Coach 2 in the scheme). 5. – After braking (without exceeding the 2 metres allowed), the player returns to the start line, Point 1’, to get ready for the 50-metre sprint (according to the scheme). The total amount of time allowed for the sprint, braking, going back to the start line and getting ready for the next start is 30’’. 6. – Before starting the 50-metre sprint the warning commands regarding the time left from the 30’’ time, as well as the preparatory commands and the signal for starting sprinting are given by COACH 2 (Coach 2 in the scheme). 7. – The player must run the 50 m. in/in less than 7’’ 7/100 (Coach 3 is in charge of timing the sprint). The player is allowed to choose how to stop after crossing the finish line. 8. – The total amount of time allowed for the sprint, braking, going back to the start line (Point 2 for the next 20-metre sprint) and getting ready for the next start is 30’’. In order that any delay might not disturb carrying out the test, the player must return to the start line, Point 2, in a tempo of medium intensity running lest he should exceed the time allowed. 9. - The warning commands regarding the time left from the 30’’ time, as well as the preparatory commands and the signal for starting sprinting are given by COACH 2 (Coach 2 in the scheme). 10.– Next, there is another 20-metre sprint, carried out under the same circumstances as the previous 20-metre one. The procedure is the same for the remaining 20-metre and 50-metre sprints and also for the resting periods between them. 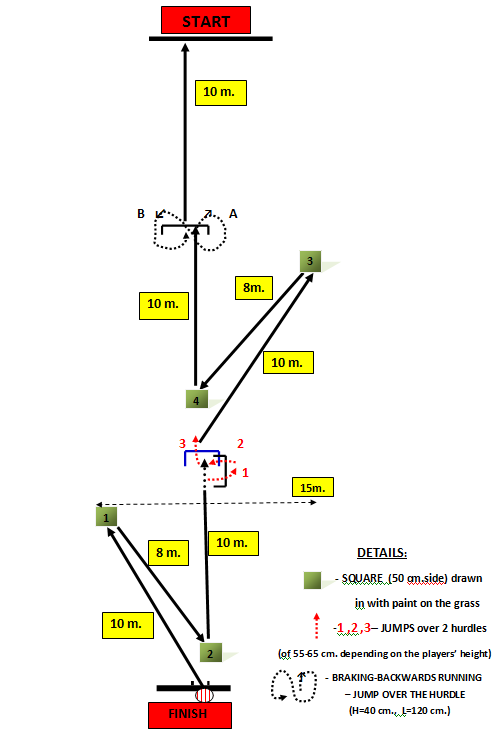 11.– After the last 50-metre sprint (which will be done from Point 6’ on the start line) the player runs the whole distance to the starting line of the track (START in the scheme) in a tempo of medium intensity running lest he should exceed the 30’’-time allowed. All the players will carry out the track for the second time at the signal given by COACH-2 (Coach 2 in the scheme). 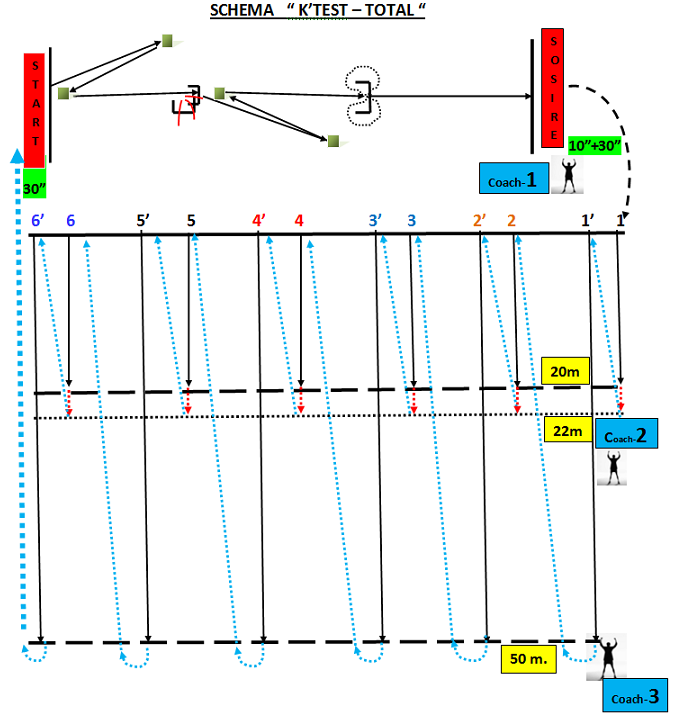 · The players need to cover the track for at least 2 or 3 times before taking the test in order to learn the moves that have to be done at high speed. READ MORE ABOUT: HOW THE K'TEST-TOTAL EXPERIMENT IS CARRIED OUT.